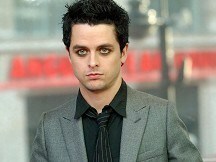 Green Day frontman Billie Joe Armstrong says his sagging trousers cost him a seat on a US flight. The singer-guitarist for the San Francisco Bay-area rock band sent a message to his Twitter followers expressing his indignation at being thrown off an Oakland-to-Burbank Southwest Airlines flight for wearing his trousers too low. "Just got kicked off a southwest flight because my pants sagged too low! No joke!" he wrote. An ABC7 news producer who was on the same flight told the station that a flight attendant approached Armstrong as the plane was getting ready to take off and asked him to hike his trousers higher. The producer, Cindy Qiu, says Armstrong initially responded by asking the attendant if there weren't "better things to do than worry about that?" But the attendant persisted and told Armstrong he could be ejected for his refusal to comply. When Armstrong insisted he was just trying to get to his seat, he and a travelling companion were taken off the plane. Southwest spokesman Brad Hawkins said Armstrong was allowed on to the next flight to Burbank and had told a customer relations agent who contacted him he had no further complaints. "As soon as we became aware of what had happened, we reached out to apologise for this customer's experience," he said. "He elected to take the next flight. We followed up with this customer and involved employees to get more details and, in our latest conversations, understand from the customer the situation was resolved to his satisfaction." Rihanna is suing over a California hillside home she claims has such serious structural defects that it is uninhabitable.